We are entering a system in which we are all cogwheels, i.e. we are beginning to make contact with each other. 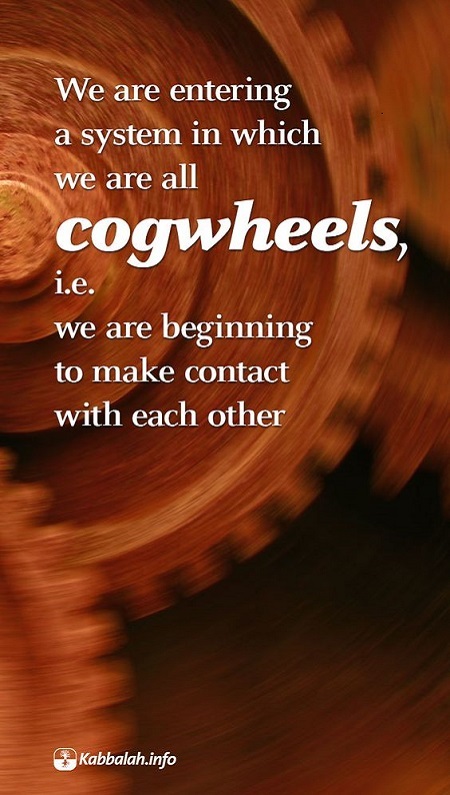 Our entire world is mutually connected just like cogwheels in a system; none of the cogwheels can turn independently without turning all the other wheels and being turned by them. It’s just like two clutch discs when they touch each other. The law of development operates in this mechanism. First, the clutch pedal is pressed and the connection between them is still weak–at this point we don’t disturb but rather help one another by spinning but not feeling that we are connected. With time, cogwheels become more closely connected i.e., the clutch pedal is released and the discs get progressively closer to one another, until they are very tightly connected. This is how all of humanity develops towards mutual cooperation: countries establish connections, international commerce and industry flourish, societies change, the number of different professions grow, and people are becoming increasingly interdependent until they are totally interdependent. The integral system possesses a remarkable property we can’t comprehend: everyone is just as vital in it as the whole.